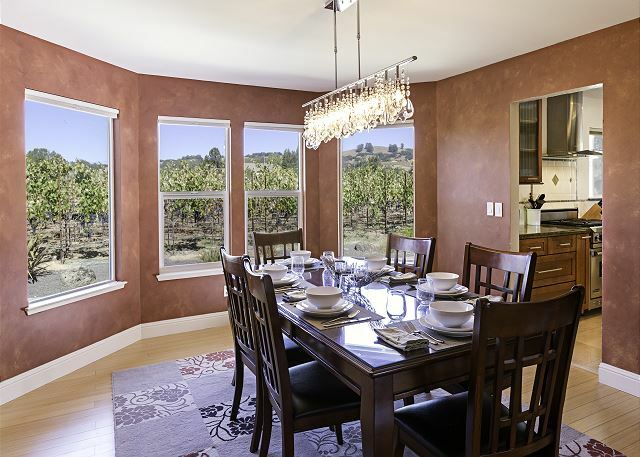 Enjoy the best of two worlds, the peace and tranquility of ‘country living’ among the vineyards and wineries of the Russian River Valley, and the convenience of being only five minutes from the historic Healdsburg’s Plaza. 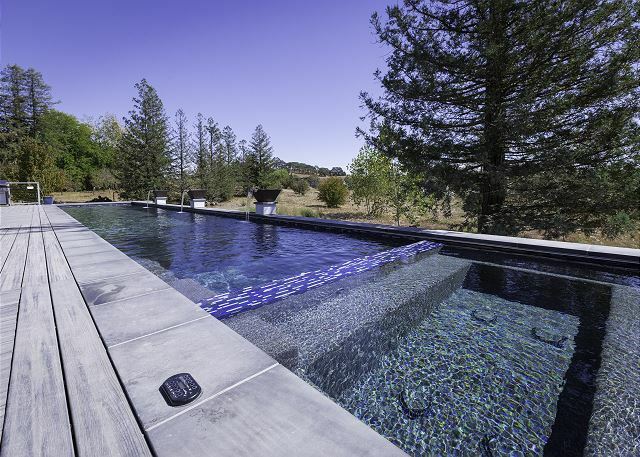 Bella Terra Healdsburg is an upscale, and modern appointed four bedroom, three bath home (one full bath is in the garage) on 1+ acre lot with central heat/AC, a large backyard deck and patio, with a deluxe new pool/spa combination. A comfy murphy bed in the den with doors for privacy makes the 4th bedroom, for accommodating up to 8 guests, in this spacious 2200 sq. ft. beauty. Walk up the brick paver pathway, enter this special retreat and ‘feel the joy’ of all the love, care, and attention to detail, sure to please the most discriminating guests. 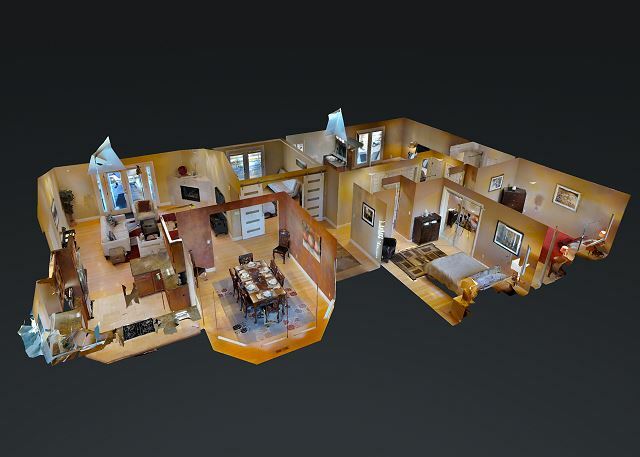 To the left of the central entry, you are greeted by the living room, dining room and gourmet kitchen. The hallway to the right leads to the luxurious master suite, second and third bedrooms, and lovely shared bath. The den is centrally located and three sets of full glass French doors with treatments, open to the large back deck and entertainment area. 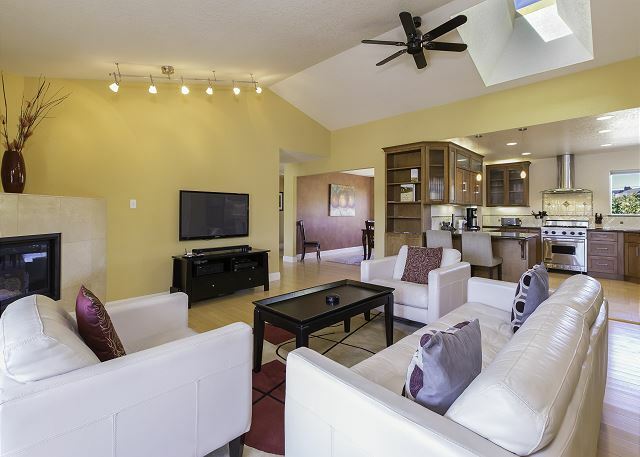 Essential for fully enjoying this great wine and food destination is a well equipped gourmet kitchen with a professional Viking stainless steel 4-burner gas range/oven and hood. It provides all the ‘heat’ you will need to create culinary masterpieces or just some simple soup ‘for your souls’. 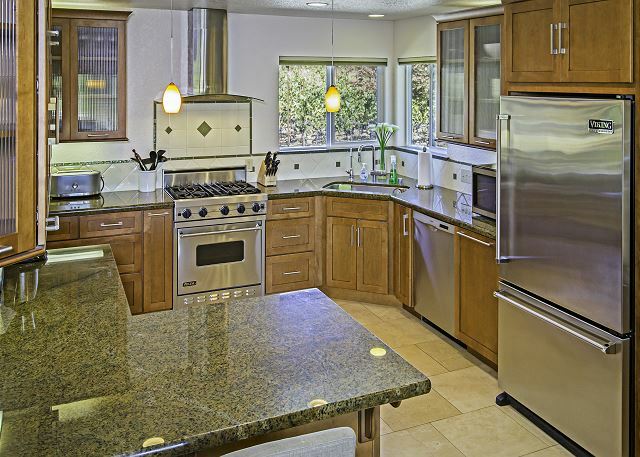 A convenient dining area along the granite countertops are bordered by the stainless steel appliances, dishwasher, microwave and Viking refrigerator. 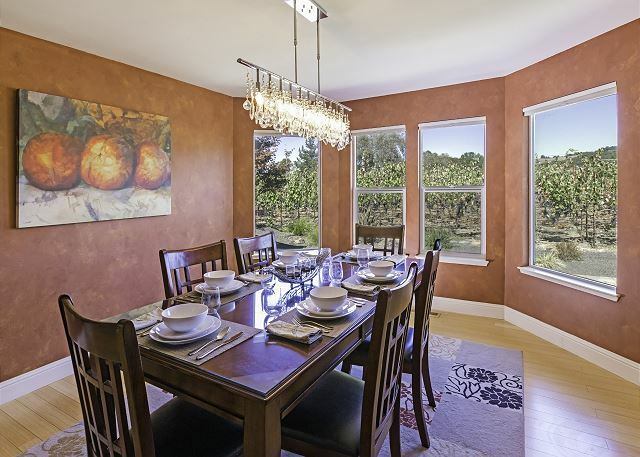 Adjacent to the kitchen is the formal dining room. It has a simple dining set that seats 8+ with a side-serving hutch illuminated by a lovely chandelier. Also open to the kitchen is the living room with vaulted ceilings, gas fireplace and French doors which open to the large back deck. A 50 inch Sony plasma wall mounted TV and entertainment center with Direct TV and DVD player is available for your viewing and listening pleasure. Next to the living room is the enclosed den (4th bedroom) with a comfy murphy bed and another set of French doors to the back porch. On down the hallway to the right are the second and third bedrooms both with comfy queen sized beds. They share a custom bathroom with travertine countertop and walk-in shower/tub, and a glass bowl sink. 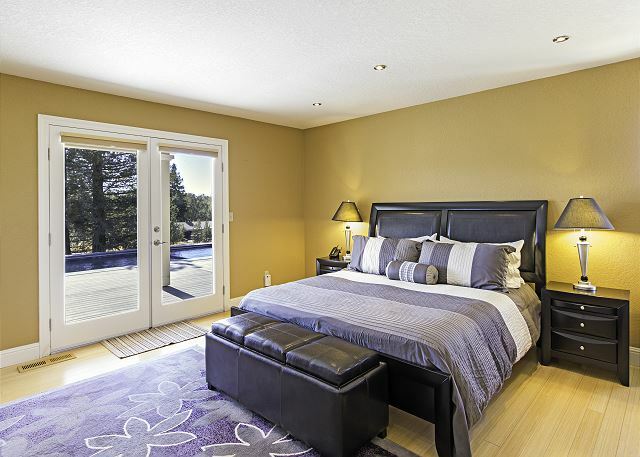 The private master suite is at the end of the hall, on the left, and is beautifully furnished with a luxury California king bed, an oversized mirror, a Bose clock radio /CD system with French doors to the deck. The master’s suite bath is spa inspired also with a large mosaic glass-slate walk-in shower with massaging body sprays and rain shower head. 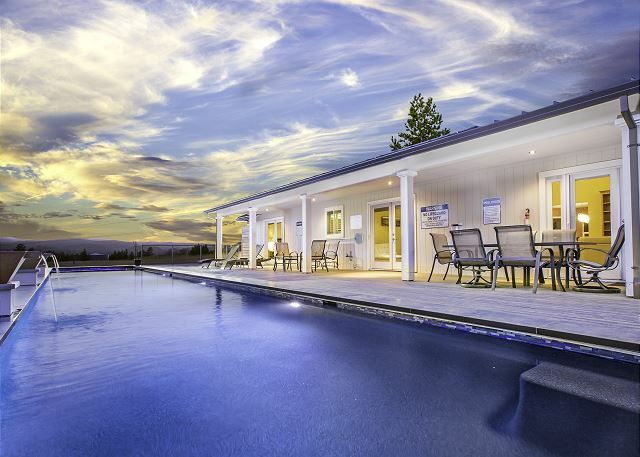 Ideally located and only five minutes away from downtown Healdsburg’s fabulous restaurants and shops, Bella Terra Healdsburg is a heavenly ‘home away from home’ in a pastoral setting among the vineyards of south Healdsburg. There are several wineries in the ‘neighborhood’ including Merriam, Limerick Lane, and Christopher, with dozens more in the Dry Creek, Alexander, and Western Russian River Valleys. 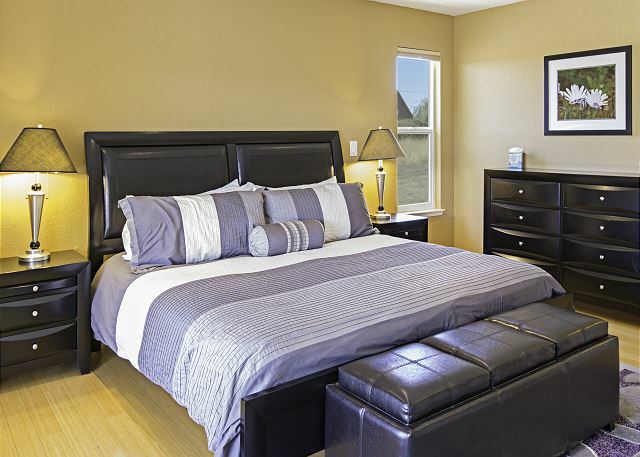 Let our home be yours so that you can relax and rejuvenate in the ‘Tuscany of northern California’. COME AND STAY AT BELLA TERRA HEALDSBURG FOR A MAGICAL AND MEMORABLE HEALDSBURG HOLIDAY. YOU MAY NOT WANT TO LEAVE, BUT YOU CAN COME BACK SOON! Stay was very good, amazing swiming pool, everything works great! 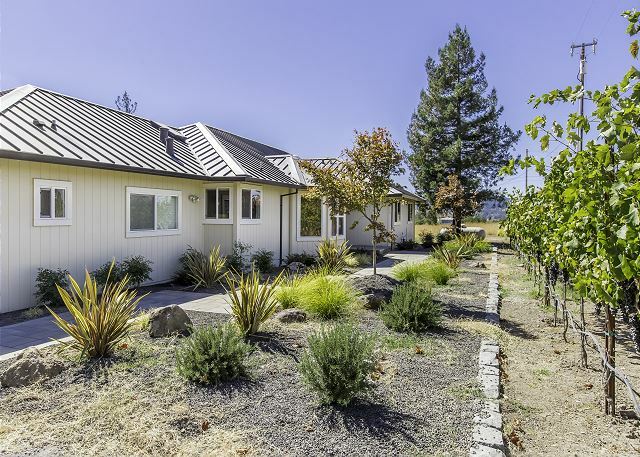 The location is great: it's quiet and conveniently located near to the heart of Healdsburg (about 8 minutes). The bedrooms are roomy with plenty of space throughout the house for guests to stretch out both inside and out. The lap pool and spa are definite attributes (gorgeous) however we were not able to turn on the spa from the house and had to request the property manager turn it on remotely. This was a drag to say the least but we were told it was being fixed and they were certainly very responsive to the issue. All in all a lovely place to stay but be sure to check with the management prior to checking in whether pool, fireplace, etc. are in working order. Thank you for staying with us and being patient with the poolside controller having broke. We are thankful it the new controller has been installed!! The fireplace is in working order again as well! We triggered a sensor when we turned it off to protect a nest and eggs that appeared in the vent. It was reset and ready to go!! We hope you will come back and stay again!! This time with a warm fire and full control over the pool, spa side! This property is a good retreat for 3 couples. One of the bathrooms is located in the garage, so if you get up at night and are not sharing the second bathroom with another couple, it is slightly inconvenient. The house was very clean and great for sitting around and relaxing. It is not a house for small children, as there is no fencing in the back and the coping around the back of the pool, could be dangerous, as there is a drop of about 4-5 feet. We had an issue with the BBQ - needed to be cleaned, and the door fell off. I did notify the property management company of this and a few other items. You can hear freeway noise from this property at night. I had a wonderful stay at this beautiful home in Healdsburg. Very convenient to the town of Healdsburg where there are amazing restaurants, wine tasting, and shopping. The swimming pool and hot tub were incredible and we all spent a lot of time relaxing in and around the pool. Only small inconvenience was that it was a little too close to the freeway. We heard the freeway noises at night. But it was so fantastic we may do it again next year! The house was clean and roomy enough for our group of 8. We were in town for a wedding, we were very busy setting up and celebrating with the Bride and Groom, so we weren’t in the house very much. But the kids found time to dip in the pool and spa a couple times, the coffee maker worked great, we drank lots of coffee, and we all slept well. It was centrally located for us between venue site and we enjoyed the views form the back deck, especially at sunset. We hope to get to spend more time on our next visit. The house was beautiful! What gorgeous surroundings! We enjoyed our stay at this home. Property manager was response, starting from the reservation process through our stay. The only issue, and quite minor, was the hot tub wasn’t hot when we arrived, but when turned up it eventually warmed up and we enjoyed it. Kitchen had really nice dinnerware and cookware. Beds very comfortable. Location felt rural and peaceful but a really quick ride to town. We would rent there again! Great home , convenient location, wonderful visit! Great location. Grapevines in the front yard. Nice looking property with a pool and spa in the back. Comfortable beds. Clean and updated. Would definitely rent again. Great stay. Fun and functional house. Clean, well tended and new furnishings...... but Ikea or dormitormy quality stuff. Pool is the best. Our party of eight used this house for a weekend trip for my daughter's 30th birthday. Everything was as expected and the pool was a great addition. My only negative was that we were experiencing temps over 100 degrees during our stay and the AC had not been turned down upon our arrival and it took many hours before the house was cool. ceiling fans would be a great addition to this house for times like this. My family and I attended a wedding in Healdsburg - this home is close to the Healdsburg Plaza as well as Windsor with easy access to many restaurants. Lovely home, well described in description, layout perfect, I would absolutely recommend this property. We frequently rent vacation properties and this was probably the best one yet! It had everything we needed, perfect layout, fantastic surroundings! We will definitely be back! Great pool and spa with a nice view. Centrally located. Easy to get to downtown Healdsburg and close too many wineries.